Mapp & Hession Pharmacy in King St is your number one destination in Murwillumbah for all your health and beauty needs since 1984. The pharmacy is multi award winning with a Tweed Shire Business Excellence Award for customer service and the Australia wide People's Choice award for Australian Pharmacy of the Year. 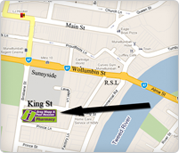 We are in King St Murwillumbah. Underneath King St Medical Centre and on street level behind Sunnyside Shopping Centre. Napoleon Perdis cosmetics, Jurlique skincare, Mor skincare, Innoxa cosmetics, InEssence Aromatherapy. Fully stocked Herbal Dispensary. Customised herbal preparations for your particular ailment. Home Health Care experts. Hire and sale of 4 wheel walkers, Commodes, Shower Chairs, Wheelchairs, Crutches. Large range of incontinence pads and specialty cushions. We pride ourselves on being the Murwillumbah pharmacy of choice for natural medicine. We also value sustainability and protection of the natural environment and we see it as our responsibility to continue to be a leader by example within the business community on taking voluntary action on climate change. Mapp & Hession has been working with Climate Friendly since 2006 to calculate our carbon emission impact from our business practices. We have offset these emissions by purchasing verified carbon credits from wind and biomass projects.